Virtual Private Network providers rely on a range of encryption protocols to help them keep your data secure and safe as you browse the internet. Their names are usually fairly incomprehensible acronyms, such as PPTP and OpenVPN, but what it all boils down to is the same thing. When your VPN creates a tunnel between your computer and its server, through which all your data will then travel back and forth, it’s an encryption protocol that keeps your data secure while it’s in the tunnel. So what’s IPSec security protocol and why is it a good choice for your virtual private network? IPSec, put simply, is a dual approach security scheme that operates at the internet layer of the Internet Protocol Suite. It can be used to defend and shield all the traffic you exchange across the internet or a private network and can be used with any application, not just those specifically designed to use it. What Can I Use An IPSec Virtual Private Network For? As you browse the internet, particularly if you do so through an unsecured public connection in a restaurant, mall or airport lounge, you risk the likelihood that your data can be intercepted along the way by a hacker, identity thief or spammer. 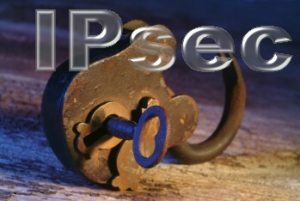 The encrypted tunnel that IPSec creates wraps itself around your data, keeping it protected from intruders, and at the same time transforms your data into completely unintelligible nonsense. It will only be transformed back again when it reaches the other end of the tunnel so, if someone happens to get their hands on it in the meantime, they won’t be able to do anything with it. Meanwhile, your IPSec Virtual Private Network alters the IP address that identifies your computer and its location to the rest of the virtual world. That IP address can be read by both the websites you visit and the online criminals you pass along the way and, if the latter get their sticky fingers on it, it can be sold to online marketing companies or otherwise used to damage you. A firewall and anti-virus suite will partly protect you from that, but an IPSec VPN is the safest way to ensure that you are browsing anonymously and safely. As well as assuring your safety, an IPSec VPN can help you access websites that are normally restricted to you, and you will do so just as securely as you browse any other site while using a VPN. Location blocked websites may include video streaming sites that are only available in specific countries or more stringent censorship if you live in or are visiting a country that places restrictions on the internet.